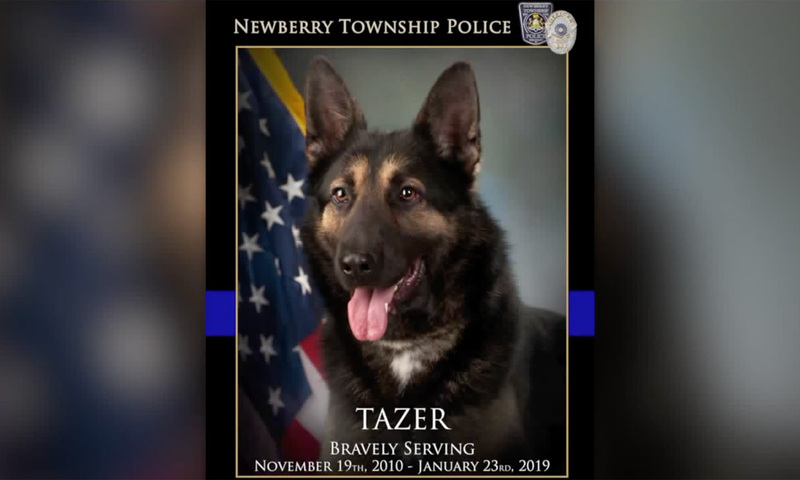 NEWBERRY TOWNSHIP, YORK COUNTY, Pa. — It was the final call for a Newberry Township K9 Officer Wednesday night. FOX43 was there for Tazer’s final moments. ‘Tazer was an officer. It’s not just losing a K9. It’s losing an officer… anyway that you look at it,” said Chief Steve Lutz. It’s all around loss for York County as well. “Tazer was the only K9 in the county that could do both… He could apprehend subjects. He could find subjects. He could sniff and find drugs… so the county is at a big loss,” explained Chief Lutz. Chief Lutz tells FOX43 he lost his vision, suffered from a broken leg, and just wasn’t acting like himself. “It’s a very very difficult decision. I’ve had to make it three times myself. It’s really tough time for the officer as well as the family and the department,” said Chief Garth Warner with Derry Township Police Department. “He didn’t present the vibe of being ill; he still presented himself as a police officer,” said Lutz. He’ll be remembered by a close bond with his handler, Sergeant Chris Martinez, and an undeniable loyalty to the department. “I’m friends with Martinez. I know where he lives. I go visit him. We hang out together, and I know his neighbors, and there wasn’t a day that gone by he wasn’t out there training with his dog every day. That’s his life,” explained Sergeant Keith Farren with Newberry Township Police Department. “He might not be able to talk or type or do reports, but when the time would come when we needed him… he was always there,” added Lutz. He says it’s too soon to say if they’ll bring on another K9 as the department needs time to heal. Even if they do, Chief Lutz says there won’t be another like K9 Tazer.